Amherst College is an exclusively undergraduate institution known for offering a well-rounded and rigorous liberal arts education. Its student body is known to be an open-minded, curious, and hardworking group of scholars. Mount Holyoke College is a liberal arts college for women located in South Hadley, Massachusetts. One of its students spent her summer interning as a Sage Corps fellow in Singapore. Middlebury College is located in quaint Middlebury, Vermont. It was founded it 1800, making it the oldest university in Vermont. Located in the heart of one of the world’s most vibrant cities, New York University is an elite private research institution home to some of the nation’s brightest students. This summer, one NYU student left the Big Apple for an adventure in the Lion city. Boston University is up next in our University Spotlight series! This summer, we had two fellows leave the beautiful city of Boston to travel the world as Sage Corps fellows! We interviewed them to find out more about their adventures in Melbourne and Paris. Today we’re featuring one of our fellows from George Mason University, home to the Patriots in the sunny state of Virginia. Keep reading to find out about GMU student Mohamad’s adventures in Chicago this summer as a Sage Corps fellow! Located in the Country Music Capital of the World, Vanderbilt is accredited for its competitive academics, D1 sports teams, and, of course, southern charm. We checked in with four of our Vandy fellows to learn a little more about what they were up to this summer. This blog piece was written by Sarah Rudd, Sage Corps’ marketing intern. Hail to the Orange, Hail to the Blue! As a senior at the University of Illinois, I was excited to reach out to a fellow Fighting Illini, Neil Limaye, to see what he was up to this summer. Neil, a Summer 2017 Sage Corps fellow, is one of the many U of I students who have participated in Sage Corps thus far, and I’m sure he won’t be the last! Neil was in Amsterdam this summer working for Pikaplant, a startup that creates products to make it easier to care for healthy plants. He was responsible for research and development on Tableau, the company’s newest product. He is a junior studying Aerospace Engineering with a minor in Computer Science. What is the most valuable lesson/ most valuable skill you’ve learned or strengthened during your internship? "I’d say as long as you give some honest, critical thought to what you’re doing, you should never be afraid to ask questions or speak your mind. Everyone you work with at a startup has a genuine interest in doing the best job, so always think about how you can improve your work." Name one of your biggest wins of the summer. "My biggest win would probably be going from knowing nothing about the Raspberry Pi to being decently good with it after about a week of Googling and tinkering." (For those of our readers that don’t know, Raspberry Pi is a tiny and affordable computer that you can use to learn programming through fun, practical projects). Why did you decide to participate in Sage Corps? "Where else can I spend a summer in Amsterdam working for a startup? There’s nothing quite like Sage Corps." There really is nothing quite like Sage Corps, as I’ve learned in the months I have been working at Sage Corps HQ. I decided to answer some of the interview questions myself to share some of my insights on my internship. I am a senior at the University of Illinois studying Communication and Psychology, and minoring in Public Relations and Leadership Studies. My biggest win of the summer would overall be having had the opportunity to combine my recent abroad experience with a summer internship in a field that I am interested in; I couldn’t have asked for more from an internship. In general, I feel that the most valuable part of my internship was the ability to work with a startup, which in turn provided me with ample opportunities to develop important skills through tangible work experience. Prior to working with Sage Corps, I had little experience with the startup world, and now it is an industry I want to continue to work within. This experience generally taught me to step outside of what is comfortable and expand your horizons — there is so much out there if you are open to new experiences, and I think that is a valuable lesson and my biggest takeaway. Coming from a relatively broad educational platform with two majors and two minors, there has never been one clear-cut career path for me to take. Not entirely sure what it was I wanted to do post-graduation, when applying for summer internships this past school year, I was looking at a multitude of positions in order to start gaining experience, ranging from HR to PR to Marketing. Ultimately, I was offered the position of Marketing Intern with Sage Corps, and accepted. Since then, I have had the opportunity to work alongside full-time marketing employees and gain hands-on experience that has allowed me to develop an entirely new skill set. I now know that I would like to hold a marketing position after graduating, and I have Sage Corps to thank for the skills I have developed and the clarity that I now have. Neil and I just returned to Champaign, and I know that both of us will be able to use the skills and insights that we have gained from our experience with Sage Corps in the coming school year. I’m not sure what the future holds for either of us post graduation, but I’m confident that we will be prepared for whatever path we choose thanks to our experiences at Sage Corps! Interning abroad provides valuable experience that employers love to see. Join the less than 1% of college students gaining international work experience today. Up next in our University Spotlight series is the University of Texas at Austin. When most people think about UT Austin, they remember the school as the home of the Texas Longhorns, and for good reason. But, when the Sage Corps HQ team thinks about UT Austin, our first thought is something else: entrepreneurship. That's because we've had incredibly talented UT Austin students participate in our global entrepreneurship program. These students are self-motivated, creative, and not afraid to push themselves outside their comfort zones. They're rock star entrepreneurs in the making! Charles spent his fellowship in Sydney, Australia as a content writing intern at Marketing Bee, a company that offers cloud-based marketing solutions to its clients. Here, he focused on creating and editing blog content for the company blog. Charles is a rising senior majoring in Business and Marketing and minoring in Creative Writing. What is the most valuable lesson/most valuable skill you've learned or strengthened while abroad in your city? "Traveling broadens perspective. There is no class, no job, no textbook that will ever teach you more about yourself and life as a whole than physically seeing it with your own eyes." "Living on Bondi Beach was by far the greatest win of the summer. There's nothing better than waking up to the sound of waves crashing." Name one of the biggest challenges you've successfully overcome this summer. "The time change between here and the States is 15 hours, so communicating with my family was tough at the beginning. But, I was able to figure out ways to chat with them when we were both awake." "Sage Corps was able to provide me with everything that I was looking for. Sage Corps helped me find an awesome job in an unbelievable city." ow has this experience helped you get closer to achieving your post-graduation/career goals? "This experience in particular has confirmed my passion to work abroad in my mid 20's. Before coming here, I was unsure if it was too far-fetched...but after living through it, I am sure that it is something I would like to do." Charles has not yet decided on his post-graduation plans. The Sydney cohort and Country Manager, Tashi, becoming fast friends at Orientation. Jonah also spent his summer in Sydney, where we worked as a marketing intern for Skippr Cash Flow, a finch (financial technology) company that provides a cash flow advisory tool to help businesses and their advisors better manage their cash flows. As a marketing intern, Jonah worked primarily on SEO and video editing projects. Jonah is a rising senior majoring in Urban Studies and minoring in Business Foundations. "I chose to participate in Sage Corps because it was an incredible opportunity to travel the world and to get more work experience at the same time. I went to work during the week and did my best to make an impact at a startup where every little decision can go such a long way. Then on the weekends, I had the opportunity to go to places like Melbourne, the Blue Mountains, Kangaroo Island, and the Gold Coast. I couldn't have asked for a better combination of "work hard, play hard"!" "Living in a foreign country forces you to go outside of your comfort zone and try new things. I never thought I would get the opportunity to go scuba diving in the Great Barrier Reef, wander the streets of Fitzroy in Melbourne, see a koala, or see a kangaroo in person (and even eat a kangaroo!). But, being in Australia for three months has allowed me to do all of that and more. For the record, the kangaroo was not one of my favorite dishes!" What is the most valuable lesson/most valuable skill you've learned or strengthened during your internship? "Working at a startup has allowed me to learn more about entrepreneurship and marketing than I ever learned while in school. These companies work at such a fast pace, and if they ask something of you that you do not know, you have to teach it to yourself and learn it as quickly as possible. The fast-paced nature of working at a startup is difficult, but very exciting." How has this experience helped you get closer to achieving your post-graduation/career goals? "This experience has helped me get closer to achieving my post-graduation goals because it's another learning experience under my belt. I've had the experience working for corporate jobs in America, and I wanted to try something new and get this work experience in Australia where there is a completely different business culture. I also got to see how startups operate and how tough it is to be an entrepreneur. For that reason, it has been a very humbling experience because these companies work harder than anyone and have such great obstacles to face." What's the most fun/coolest thing you've done with your cohort this summer? "Just going out and letting loose after work with the other cohort members was always a good time. Although Sydney doesn't seem like a foreign place at all, it was fun being with some other Americans and bonding over things going on over in the Northern Hemisphere!" "Overall, this is an experience that I would do over and over if I could. I am thankful to Sage Corps and to Skippr for making all of this possible and for helping me expand my knowledge of the business world and the world as a whole!" Upon graduation, Jonah hopes to enter the Real Estate industry and work on investment related projects. Now that Charles and Jonah are Sage Corps alumni, it's time for them to apply the knowledge they gained and the experiences they had in Sydney to their next adventures. We're excited to see what's next for them, and are here to support them every step of the way! Located in beautiful Claremont, California at the foot of the San Gabriel mountains, Claremont McKenna College is home to some of the nation's brightest liberal arts students. Six of them left Claremont for the summer to intern around the world as Sage Corps fellows. We spoke with four of them about their experiences. 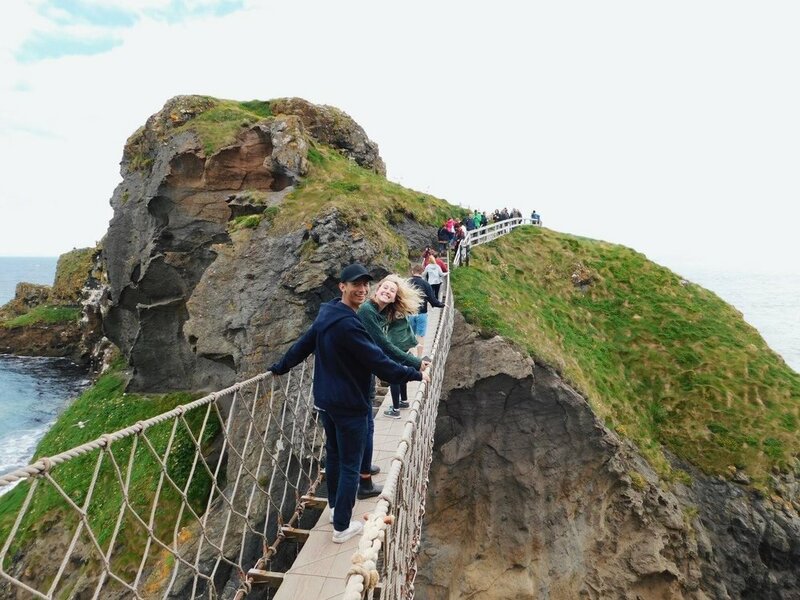 Kimmy spent her summer in Dublin as an intern at FenestraPro, a startup that provides cloud-based software tools for architects to optimize the design of building facades. At FenestraPro, Kimmy worked on redesigning the company's website and managed customer relations initiatives. She is a junior studying International Relations and Legal Studies. I chose Sage Corps because it offered me a vacation and work experience in one. I could explore a city that many of my friends had recommended to me while experiencing my first professional tech environment. One of my biggest wins of the summer was the people I lived with. My cohort was awesome and I lived in an apartment with 5 of them; it could not have been better. We are all best friends and did a lot of fun things together. It was really nice to get home from work to a house full of friends. What is the most valuable lesson/ most valuable skill you've learned or strengthened during your internship? The most valuable skill I learned during my internship was adaptability. I came in with an open mind and was able to learn a lot more because of it. I did not expect to do so much web design, but I did and I learned a ton. Being adaptable in any workplace is crucial, and working abroad teaches you how to do it very quickly. How has this experience helped you get closer to achieving your post-graduation/ career goals? It has given me a taste of industry-level work and what electrical engineering is like in the real world. It has helped me decide what my major is, as well as what kind of a worker I am. Upon graduation, Kimmy plans to gain international work experience before attending law school. Kimmy and Kazandra's cohort adventuring in Ireland. Like Kimmy, Kazandra spent her summer in Dublin. She worked as an intern at Sensipass, a technology company that specializes in three-step security authentication. At SensiPass, Kazandra worked on the company's biometrics face scanner. She is a rising sophomore. Although she hasn't yet decided on a major, she knows that she wants to pursue a career in the STEM field. Developing relationships with a diverse group of minds within my cohort. What's the most fun/ coolest thing you've done with your cohort? On a weekend trip to Galway, one of the many famous cities in Ireland, I visited the ruins of Menlo Castle. It has been my long-life dream to visit such ruins and it was an incredible experience. What is the most valuable lesson/ most valuable skill you’ve learned or strengthened while abroad in your city? I believe I subconsciously placed the United States at the center of most activities related to entrepreneurship and technology. However, after being in Ireland for only a couple of weeks, I removed this perspective. The startup scene and culture in Dublin is enormous and steadily growing. There is so much talent and creativity in Ireland that it would be a shame to only look to the United States for guidance in these fields. Since I plan to work internationally, I find this mental reminder refreshing. Although my internship was technical in nature, since I was able to interact with the CEO closely, I was able to pick up small entrepreneurial traits as well. The ability to see the connection between entrepreneurship and technology will be vital when I am pursuing my MBA/MS in STEM. Additionally, I plan to do work outside of the United States and interning internationally has aided me by mentally removing America from the center of all business interactions. After receiving her Bachelor's degree, Kazandra plans to pursue a joint MBA/MS in Engineering then earn her Ph.D. in Biomedical Engineering. Adele was in Buenos Aires, Argentina this summer working as an intern for Increase, an online platform that simplifies the control of credit card payments received by merchants in a safe and secure way. At Increase, Adele worked as a Business Associate Intern. She worked directly with Increase executives on product and marketing strategies. When I looked ahead to the summer I knew I wanted to work for a startup or live abroad, and Sage Corps gave me the opportunity to do both. One of the most valuable lessons from living abroad is learning to be open minded. Allowing yourself to go all-in and live without inhibition is the best way to learn. What's the most fun/ coolest thing you've done with your cohort so far this summer? We were always having a great time exploring, dancing, and eating our way through the city together. I am not sure what I will be doing post-grad, but this experience is proving invaluable in broadening my perspective and learning about the way I think and approach the world. Her favorite advisor at CMC, Kari Rood, offered her insights on the value of an international internship experience for her students. Adele's favorite professor at CMC, Laura Grant, Assistant Professor of Economics, also shared her insights on Adele's Sage Corps fellowship. "During study abroad, even the brightest student acquires much more than she seeks. The exposure provides skills and competencies that a professor cannot teach in the classroom. Other cultures inform thinking and broaden perspectives, which the student then weaves into everyday interactions and solving big challenges. 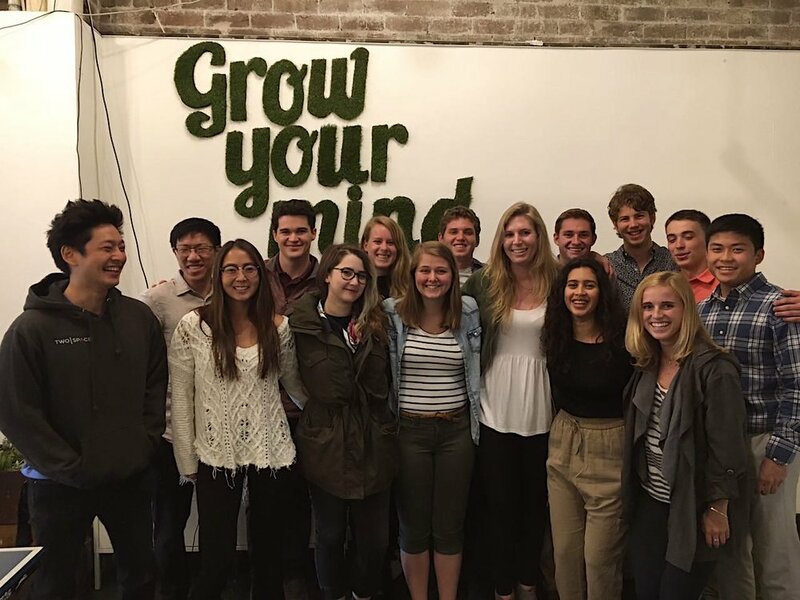 Sage Corps pushes the practicality further by layering on a learning-by-doing internship. Perhaps most importantly, the experiences also tap into our innate senses of humanity and connectedness. The student returns to campus reflecting the newly ingrained knowledge. She makes more of a practice not simply to exist in the world, but to enrich and to pass on this inheritance. " Upon graduation, Adele plans to follow her gut instincts and enjoy whatever opportunities present themselves. 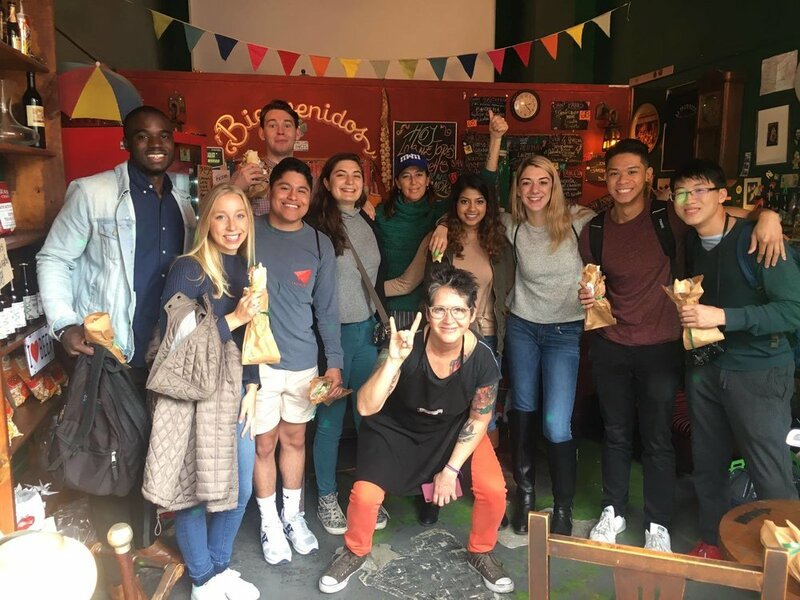 Adele and and some of her cohort smiling with their sandwiches in Buenos Aires! Like Adele, Hunter spent his summer in Buenos Aires. He interned at PagoRural, a company with the mission of helping individuals in the agribusiness gain capital in a lower-risk, more efficient way than that of traditional lending institutions. He is a rising sophomore and is currently undecided. I would say learning how to navigate a city alone, that I've never been to before, especially when I don't speak a word of the local language, has really increased my appreciation for my life back home. It has also developed my patience and has given me mental strength. If I can adapt and hustle here, I'm sure I can do it anywhere. Name one of the biggest challenges you've overcome this summer. Balancing a 12 hour job with extracurriculars was a feat. This experience was as great as it can get for me because I was surrounded by entrepreneurs (and I hope to be one one day) every single day. I learned the character traits necessary to be one, the intellectual capacity required for success, and how to get support for your startup. All of these are incredible insights that directly translate over to my future ambitions. I decided to participate in Sage Corps because I wanted to work at a startup with a global mindset, and this was the best way of getting connected and introduced to that world. Post-graduation, Hunter plans to travel the world and be an entrepreneur. We are so impressed with all of our Summer 2017 CMC fellows! We know that they all have bright futures ahead, regardless of the paths they choose!